Wow. 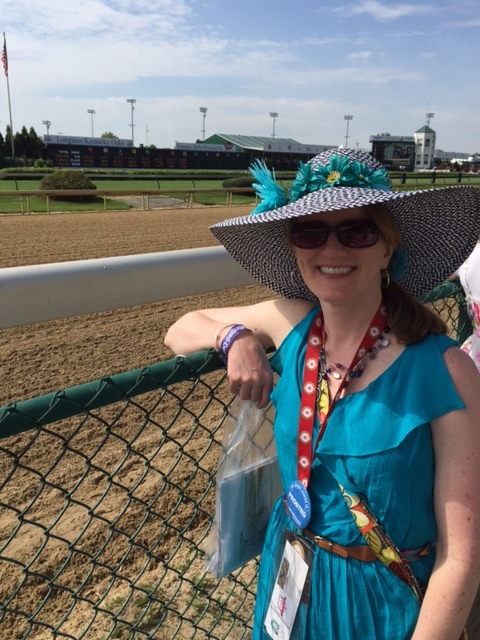 A simple word to describe our recent experience at the Kentucky Oaks and Kentucky Derby. A dream come true for me to attend these races where I watched history being made. In addition to amazing, sunny weather in Louisville, our days went off without a hitch. We met many people, saw beautiful horses, got autographs from jockeys and ate and drank too much. Frankly, it was an awesome sensory overload! There is so much to write and share but believe it or not, it’s difficult to pull it all from my mind to the computer. I keep reliving the sights and sounds, the excitement and nostalgia. I loved this experience, yet I had a few moments of sadness….because it reminded me how much I miss the ability to ride these majestic animals, how much I miss ‘talking horses,’ and how much I miss the peace being at a barn brings to my heart and soul. I am grateful to have this awesome experience. 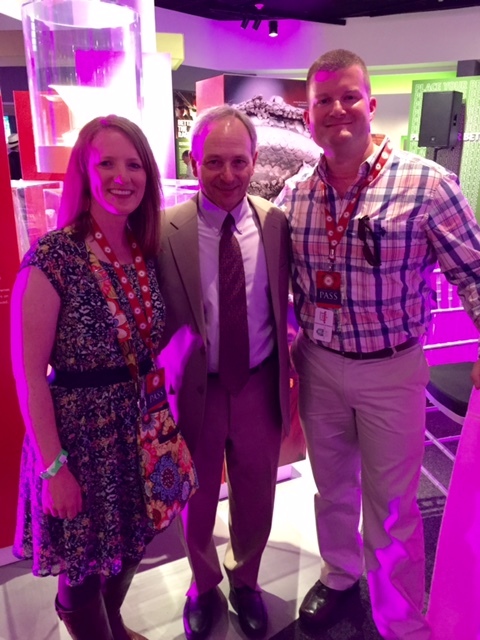 Meeting famous jockeys. This may have been one of the best parts of the experience for me. 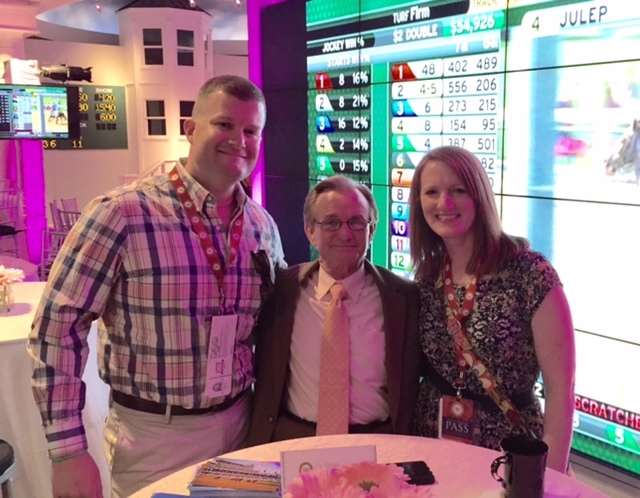 We talked to Pat Day and Steve Cauthen both days, hearing their racing stories, getting autographs and pictures, and simply hanging out. Throughout childhood, I watched Pat Day ride to victory more times than I can remember. He rode one of my favorite horses, Easy Goer, won the Derby on Lil E. Tee and accomplished so much more. Steve Cauthen holds a rare title of Triple Crown jockey (only 10 others). Both of these men are kind, genuine and legends in their industry. Kentucky Derby Museum. Only our VIP private lounge provided access to the museum. This great place showcases so much history on the race, the horses and people, and the industry in general. I loved wandering through the exhibits to read facts and see artifacts from races. A package deal. We booked a package through Quint Events/Derby Experience. It was tough to swallow the cost but in the end, we were quite pleased with the experience and included options. The package for both the Oaks and Derby included lodging, transportation to/from the track, fast entrance, grandstand box seats, food/drink in a private lounge, live entertainment by Taylor Hicks, jockey meet & greets, gift bags and on site staff assistance. Having someone else plan everything certainly let us enjoy the days a bit more. Churchill Downs track ready for the horses! The track. Churchill Downs is a beautiful track that makes history. Secretariat still holds the speed record (1973) and only 11 horses have gone on to win the Triple Crown, yet every year another horse wins the Kentucky Derby with the hopes of taking the coveted crown. Maybe American Pharaoh will do it this year? Taylor Hicks‘ performance. Admittedly, I didn’t know much about Taylor Hicks and his music before this trip. My mom, sisters and nieces are big American Idol fans. I am not so took their word that Taylor was a good performer. And they were right. I’m a fan now. I enjoyed his music quite a bit. He was an incredibly nice, down to earth guy too. We enjoyed talking to him and his band members throughout the day. The crowd. History was made on both days with attendance – more than 150,000 for the Oaks and more than 170,000 on Derby day. So many people dressed in their best, with fun hats on men and women, bow ties, bright colors and big smiles. We met some really nice people – whether horse-savvy or not, we were all there to enjoy the days. And as the horses come running down the backstretch, you almost forget which one you’re rooting for as the energy and cheers from the crowd propel the pack to the finish line. Lilly and mint julep. The official drinks of the Oaks and Derby, these two drinks pack a punch. I wasn’t keen on trying a mint julep since I don’t like bourbon but I knew I had to try one at the Derby, so of course I did. Every year, more than 120,000 mint juleps are served at Churchill Downs during the Oaks and Derby, requiring more than 10,000 bottles of Old Forester Mint Julep ready-to-serve cocktail, 1,000 pounds of fresh mint and 60,000 pounds of ice! The Lilly is the official cocktail of the Oaks, made with vodka and cosmopolitan mix. It was delicious. Box seats. We really debated which seats to reserve (of course the price went up the better the view). We ended up with box seats on the third level, which offered a great view of almost the entire track. We weren’t quite at the finish line but close enough (and big screens in the infield showed the entire race). Plus I was thankful for the cover from the shade. The one odd thing we encountered was that seats were missing from our box so we had to find an usher to track down two more chairs for our box-mates. The infield. Very crowded, slightly chaos is how one might describe this area of the track. From what I’ve heard, people go here to party rather than focus on watching the race. One gentleman we met said to watch for the naked, drunk man running across the top of the porta-potties (we didn’t see this). It’s a much more casual environment. We planned to check out the infield on one of the days but ran out of time so never made it. Watching some antics from our box seats showed a very crowded area. I’m sure it’s fun. And of course, the horses. Watching these horses walk to the paddock to get ready, step onto the track for the post-parade, enter the starting gates, then put their heart into the race to the finish absolutely shows the heart, personality, strength and agility each animal possesses and thankfully shares with us. Lovely Maria had a strong showing in her win at the Kentucky Oaks, although I was impressed with I’m a Chatterbox’s come-from-behind third place finish. 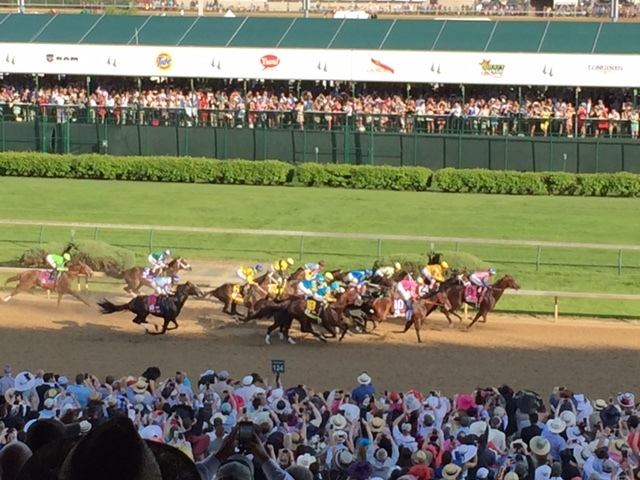 American Pharaoh was the favorite in the Derby, and he lived up to the hype. Firing Line showed awesome talent as he fought for the lead, and Dortmund demonstrated his speed. Even my choice, Frosted, made a strong showing at the end, reminding us that these races can be any horse’s good day. These are events that I highly recommend for anyone to experience. You obviously might enjoy it a tad more if you’re a horse-lover like me, but I think anyone would enjoy the excitement and history packed into these days.